Aguardiente is a fiery liquor made from the juice of pressed sugar cane (see cane pressers). This bottle is corked with a piece of palm wood sealed with packing tape. 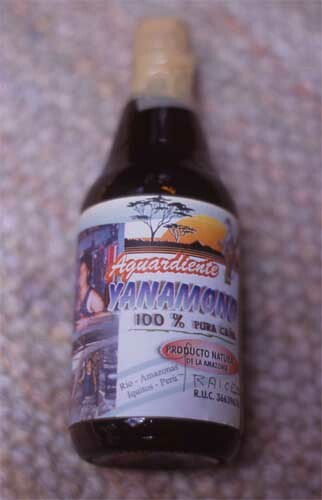 The hand-written "7 RAICES" (= seven roots) to the bottom right of the label refers to a flavorful concotion supposed to have medicinal properties. This is made by steeping roots from seven types of plants in the rum.